Many of you have hinted that you'd like to race the Falmouth Road Race this summer. Again, I offer up my home (my parents will not be there that weekend - whoohoo) in Massachusetts if we can get a posse of people together who want to journey to Cape Cod for a great race and a little RnR. I will "see what I can do" with the race directors, but in order to do that I need a rough idea on a roster along with your respective 10k PRs. 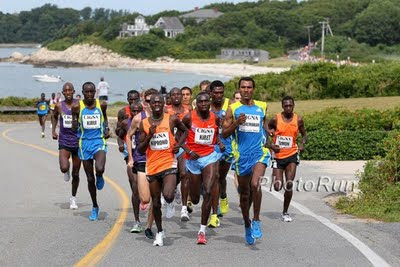 Falmouth is a point-to-point 7 miler along Nantucket Sound in the same professional vein as Cherry Blossom, Bix and Peach Tree. Me too, if you have extra. I don't have any entrees...yet. I am submitting 10k PRs to the Elite Coordinator in the hopes of acquiring some. I would like to run this. Thanks Jake.